November 2018 25 a piece of art that represents the soul of a place. One such fire sculpture is the Bridge at Bethlehem Steel, commissioned by a nonprofit organization called ArtsQuest. Colombo relates that the people of Bethlehem Steel "wanted a fire sculpture [there] that would represent that the steel factory was coming back to life, in a way." Not only does this fire bridge have a unique appeal, but it also commemorates the Bethlehem steel factory and its importance. A line of blue flames runs the length of the arc and represents the constant blue flames of the steel that was being poured when the factory was in use. On the manufacturers website, the Corten steel bridge is noted as "a physical and spiritual arc between Bethlehem Steel's past production of the country's most noted steel spans, and the future of the site as a revitalized cultural mecca." 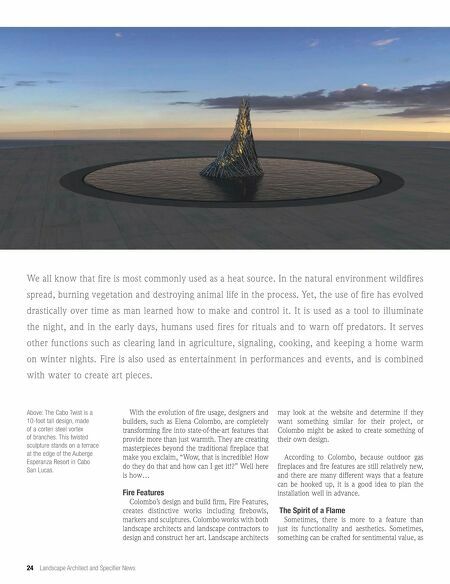 A Destination Spot Some fire displays are created to draw attention and attract people to a specific location. For instance, one feature that has become a destination site for photographs is the Cabo Twist, more commonly known as the Branch Twist. 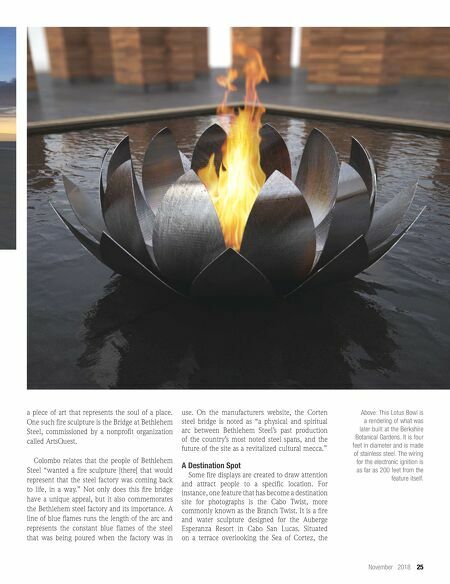 It is a fire and water sculpture designed for the Auberge Esperanza Resort in Cabo San Lucas. Situated on a terrace overlooking the Sea of Cortez, the Above: This Lotus Bowl is a rendering of what was later built at the Berkshire Botanical Gardens. It is four feet in diameter and is made of stainless steel. The wiring for the electronic ignition is as far as 200 feet from the feature itself.